The Surrey Solar Array Drive Mechanism (SADM) provides a continuous power transfer of solar array power and signals to the spacecraft while sun tracking on a small low-Earth orbit spacecraft. Surrey derived this technology from that developed on NigeriaSat-2 (the Antenna Pointing Mechanism (APM)) and GIOVE-A (slip ring). The SADM sustains interface loads which are expected during solar array deployment. A tracking array can be used to reduce the number of solar arrays required for the mission, thus providing a cost-effective solution for high-power missions. 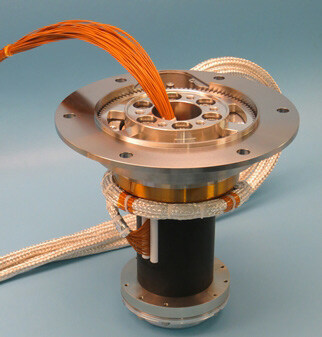 The SADM consists of an actuator, a slip ring assembly (composed of a collector for power and signal transfer), and sensors for position feedback. The SADM provides direct interface to the spacecraft sidewall structure with trim hinge external to the spacecraft and the hinge outside. The SADM can be supplied in a single sun tracking axis or bi-axis (sun tracking axis plus trim axis) and with or without drive electronics.